This construct is an envelope stress sensitive biosensors able to achieve fast spatiotemporal analysis of bacteria response to stimuli. This construct is the main component of the Envelope Stress Responsive Bacteria developped by the 2014 EPFL iGEM team. We conducted five main experiments with this Biobrick demonstrating how it works and that it is suitable for the development of the first BioPad ! For more information concerning the experiments conducted with this biobrick check out our wiki ! CpxR is the relay protein in the stress resonsive CpxAR two component regulatory system. It has been shown by split beta galactosidase assay that CpxR dimerizes when phosphorylated (activated) in yersinia pseudotuberculosis. 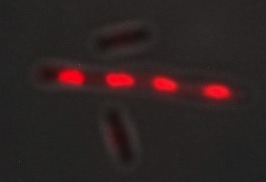 Moreover, following other in vitro FRET studies, it was shown that E. coli CpxR interacted with itself. We therefore hypothesised that dimerization would also be true in vivo in E. coli. 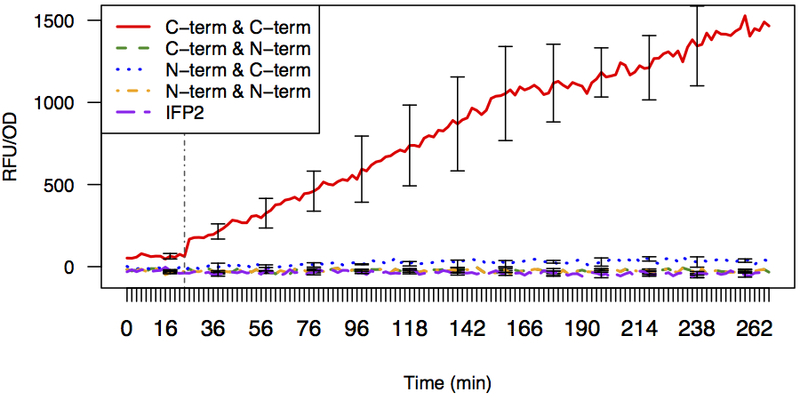 This experiment aimed to determine if and how CpxR dimerised in vivo in E. coli. 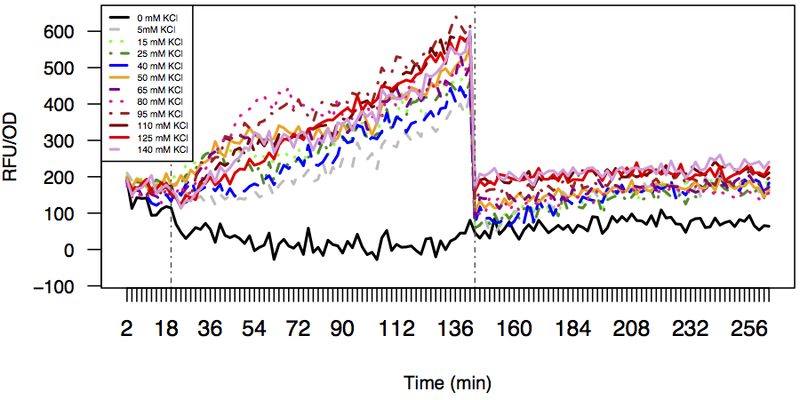 This experiment intended to get a first idea of the real-time temporal dynamics of the activation of CpxR (the cytoplasmic relay protein of the CpxA-R pathway) by KCl stress via CpxA (the periplasmic sensor protein of the CpxA-R pathway). This experiment is a first of its kind. To evaluate if and how CpxR dimerized under KCl stress, we built by gibson assembly four constructs with the various possible orientations that the split IFP1.4 fragments could have with CpxR: IFP and IFP on the N-terminus of CpxR, IFP on the N-terminus of CpxR and IFP on the C-terminus of CpxR, and finally IFP and IFP on the N-terminus of CpxR. The split IFP fragments were provided by the Michnick Lab, and the CpxR coding region was amplified by PCR from extracted E. coli genome (Bacterial Genomic Miniprep Kit from Sigma Aldrich). The protocol for stressing the cells and reading the fluorescence can be downloaded <a here. As seen in the graph bellow, induction of the signal was done at minute 24 (marked via a vertically spoted line). The construct with IFP fragments on the C-termina responded immediately to stress. In a fact we observed a 3 fold signal increase in 2 minutes. All other constructs we observed a low baseline signal non responsive to KCl stress. It is to be noted that the C-termina constructs always had higher signal levels than the other constructs. This leads us to believe that the PBS used to resuspend our cultures led to small levels of stress (the PBS we use does not contain KCl but traces of NaCl). The 30-fold signal increase from the baseline allows us to assert that our constructs responds to KCl stress. We successfully proved that CpxR dimerized in vivo and that dimerization led to close interaction of its C-terminus. This finding suggests that CpxR binds via its C-termina. This leads us to hypothesise that the CpxR dimerisation mechanisms is the same for other members of the highly conserved OmpR/PhoB subfamily. This hypothesis could allow the development of similar system that could the study other components of the OmpR/PhoB subfamily and thus lead to a new generation of highly senstitive and reactive biosensors. Having found that KCl was a good signal inducer for our signal, we decided to characterise our biobrick by testing if the signal could be modulated by various concentrations of KCl and if we were able to remove the signal by centrifugation and medium change. To do so, we read our signal for 20 minutes without stress and then added KCl. At minute 144 we centrifuged our cells and replaced the medium with PBS to be able to get a shutdown of the signal. We successfully showed that increasing concentrations of KCl led to stronger signals up to a saturation concentration of about 80 mM KCl. Moreover we were able to shut the signal down, thus proving the reversibility of our system. These results prove the reversibility of the split IFP1.4 and suggest that real-time temporal dynamics analysis are possible for our system. Having shown that we were able to monitor the temporal dynamics of our construct, we wanted to see if we were able to analyze the spatial dynamics by microscopy. To visualize the activation of our construct, we prepared cells as above for the previous plate-reader experiments, spread 10 µl on a glass slide added a coverslip and imaged them on a Zeiss Axioplan with a x100 objective and a APC (Cy5.5) filter. The pictures shown bellow were taken with a 5.1(s) integration time. As seen in the pictures bellow, we were able to distinguish specific patterns within bacteria. We observed two phenotypes within our population: elongated and normal cells. The difference in these phenotypes was noticed in previous experiments and is most certainly due to the CpxR overexpression as we observed this also in non-stressed conditions. In the first phenotype (elongated) we were able to distinguish several bands that seem fairly uniformly distributed. In the second phenotype (normal) we observed a single band in the center of the bacteria. These observations led us to believe that CpxR might be involved in the division process of E. coli as it seems coherent for cells to slow down division upon stress. After looking into the literature, similar bands were visualizable in E. coli for factors related to septum formation such as ftsZ or pbpB. Nevertheless when comparing our patterns to the ftsZ and pbpB patterns, we noticed that CpxR might be localized in opposition to these factors. Further experiments comparing the sub-localization of CpxR and ftsZ could help the scientific community better understand how E. coli monitor division under various environments. To take a look of more of these awesome pictures, check out this link! Knowing that we were able to able to visualize CpxR-IFP activation under a microscope, we proceeded to trying to activate the pathway by mechanical stress on a microfluidic chip - the ultimate barrier to building a functional BioPad ! To induce this stress, we turned on the buttons of our SmashColi microfluidic chip at a pressure of 25 psi. We imaged chambers before stress and after stress (10 min after button activation). A drastic increase in signal was detected !